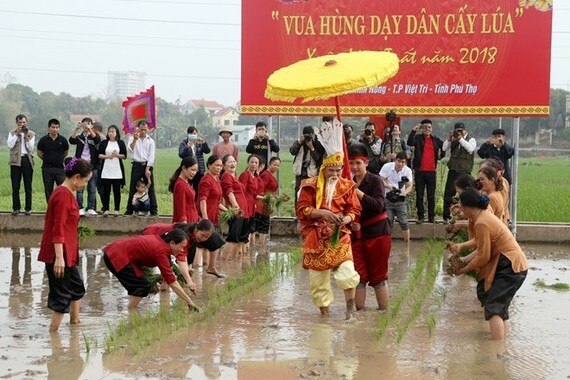 A festival commemorating the legendary Hung Kings’ teaching of rice cultivation to people was held in Minh Nong ward of Viet Tri city in the northern midland province of Phu Tho on March 2 (the 15th day of the first lunar month). The festival featured rituals performed by local elderly people, the re-enactment of Hung Kings’ teaching of rice cultivation, a rice planting competition, and folk games. The rituals took place at “Dan Tich dien” (Ploughing platform), which is located in the land lot believed to be the place where Hung Kings taught local people how to grow wet rice. 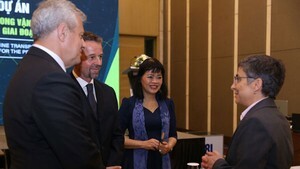 According to Chairman of the Minh Nong ward People’s Committee Nguyen Van Bang, head of the festival’s organising board, before 1945, the festival had been held annually in spring. After years of interruption, it was revived in 1993 and 2000 but was later suspended due to certain reasons. The revitalization of the festival is to preserve the beautiful traditional cultural values. It is also a basis for Phu Tho province to compile a dossier seeking the recognition of the festival as national intangible cultural heritage from the Ministry of Culture, Sports and Tourism. Bang said the event was the first among a series of activities of the Hung Kings Temple Festival, which marks the ancestral anniversary of the legendary founders of the nation on the 10th day of the third lunar month. The Hung Kings are believed to have founded the first nation in history of Vietnam, called Van Lang, in Phong Chau (now Phu Tho province). The worship of Hung Kings was inscribed on the Representative List of the Intangible Cultural Heritage of Humanity by UNESCO in 2012.